Update: Local media has reported that authorities have apprehended eight suspects believed to the be the hijackers of the Orkim Harmony. KUALA LUMPUR, June 19 (Reuters) – The hijacked oil tanker Orkim Harmony has been released by pirates, who fled in the ship’s rescue boat, Malaysian navy and maritime officials said on Friday. The Orkim Harmony, hijacked on June 11 off the Malaysian coast by pirates reportedly armed with pistols and machetes, was now being escorted by the navy to Malaysia’s Kuantan Port. Officials said only one member of the 22 crew was injured, suffering a gunshot wound to the thigh. Three Malaysian navy ships and two aircraft were hunting the fleeing pirates. 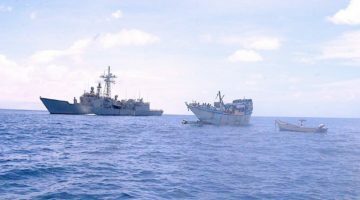 The hijacking is the second seizure of a tanker by pirates in Southeast Asia this month, raising further concerns over piracy in the region. The 7,300 deadweight tonne (DWT) Orkim Harmony was hijacked about 30 nautical miles from the Malaysian port of Tanjung Sedili carrying around 50,000 barrels of RON95 gasoline. The Malaysia Maritime Enforcement Agency (MMEA) said the gasoline on the ship was owned by state-controlled oil and gas company Petronas. The Orkim Harmony is operated by Malaysia’s Orkim Ship Management. On board is a crew of 22, including 16 Malaysians, five Indonesians and one Myanmar national. After the tanker was hijacked, the pirates repainted the ship and changed the name to Kim Harmon. Malaysia’s Chief of Navy Admiral Abdul Aziz Jaafar says eight pirates were involved. The Malaysian naval vessel shadowing the tanker in Vietnamese waters on Thursday was trying to persuade the hijackers to surrender, says Jaafar. Early on Friday, Malaysia said the hijacked ship was still being shadowed by a navy ship and had been redirected to Indonesia’s Natuna Island, where it was expected to arrive on Saturday. A subsequent MMEA report said the pirates had fled the ship. Earlier this month, a 7,100 DWT oil tanker, Orkim Victory, carrying diesel loaded from Petronas was hijacked on June 4 in the same area and on the same route.